I've been on a mission to replace my conventional make up with eco-friendly products that perform as well or better for a while now. My quest has led me to some pretty awesome brands. The latest is Australia's Nvey Eco. The entire line is free of parabens, sulfates, phthalates, synthetic dyes and synthetic fragrances. It is "the only cosmetic brand to be certified organic by the Organic Food Chain." I tried the Organic Eye Shadow ($24) which comes in 24 richly pigmented, vivid hues with amazing staying power. They are talc-free and contain chamomile which is great for dry or sensitive skin types, but suitable for all. I also tried the line's Lip Lustre ($24), a high shine, moisturizing lip color made with protective organic beeswax. It glides on smooth, not sticky and looks great both alone or over lipstick. I love the items I've been using and look forward to trying other products from the line like their Organic Mascara and Organic Creme Deluxe Foundation. 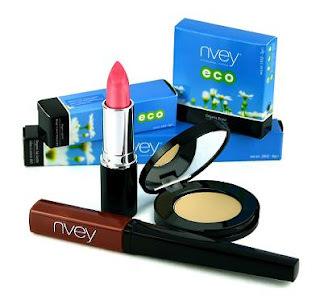 Nvey Eco is available at Macy's, online or in stores. I LOVE their cake eyeliner! It looks good and lasts! So glad you found them! I need new eye shadow... I will have to try! This brand is rubbish. I went out and bought one of everything they offer, so excited to have the organic makeup opportunity after reading so many people that i look up to, advertising this brand and found that they obviously dont test before they suggest you buy because their foundation and powders are cakey and gross. very disappointed.